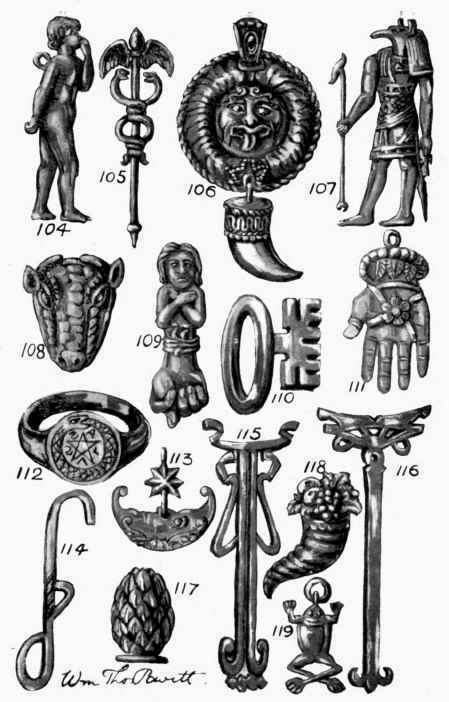 Paintings Of Hands are to be met with throughout Italy, Syria, and Turkey, Asia, and India as symbols of good luck and for protection from witchcraft, showing how widespread and universal is the idea of the efficacy of the human emblem to push away and combat trouble and evil. One called Merzoum, in the shape of a gold star, is said to have the power of making traitors confess; some years ago one of the Shah's brothers was suspected of treachery and this Talisman shown him, when terrified and overcome by remorse, he is said to have confessed his crime. Another powerful Talisman is a diamond set in a scimitar which renders him invincible. He also possesses a cube of Amber, said to have fallen from Heaven in the time of Mohammed; the virtue of this is to render its wearer invulnerable if worn round the neck. Another marvellous charm is a golden box set with emeralds and blessed by the prophet. This is said to render members of the Royal Family invisible as long as they remain unmarried; the Shah, however, had numerous wives before he became its possessor, so that its powers remain untested. Persians of high rank make use of Rubies, Emeralds, and other Gems, tied round the arm with pieces of red and green silk, as charms against the fascinations of the Devil whom they call "Deebs". No journey is ever undertaken without first consulting a Book of Omens, each chapter of which begins with a particular letter of the alphabet, some fortunate and some inauspicious; should they unluckily pitch on one of the latter the journey is immediately postponed. Persians have also a curious custom of charming Scorpions, of which, says Pinkerton, there are great numbers in that country, and they believe that by making use of a prayer, a person gifted with power of "binding" (as it is called) can deprive the Scorpion of its sting. To do this the charmer turns his face towards the sign Scorpio in the heavens, repeating a special prayer, and at the conclusion of each sentence claps his hands. After the ceremony his hearers do not scruple to handle scorpions, so great is their faith in the efficacy of the charm.